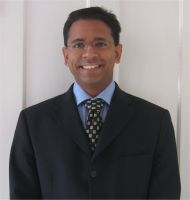 Dr A Ghuran is a consultant cardiologist at the East and North Hertfordshire NHS Trust (Lister Hospital, Stevenage and Queen Elizabeth II Hospital, Welwyn Garden City). He qualified from the University of Edinburgh in 1993 and completed his post graduate higher specialist training in general medicine and cardiology in hospitals around London including: St. George’s Hospital London, King’s College Hospital London, and the Sussex Cardiac Centre Brighton. He secured a one-year interventional fellowship to work at the Onze Lieve Vrouwe Gasthuis (OLVG) hospital in Amsterdam where radial angioplasty was first performed and pioneered. Throughout his training, Dr. Ghuran has worked with eminent European and world leaders in cardiology. Dr Ghuran is trained in performing multivessel and complex coronary artery intervention (angioplasty/stents) using both the radial and femoral approach. In addition to general cardiology and percutaneous coronary intervention, Dr. Ghuran also has an interest in pacemakers, heart failure, valvular heart disease, syncope, hypertension, palpitations and arrhythmia management. Dr Ghuran was awarded the degree of doctor of medicine (MD) in 2006 after completing his thesis (“Electrocardiographic Monitoring of Myocardial Ischaemia – Novel Methods and Potential Application in Implanted Devices”), under the aegis of a Wellcome Trust project grant. He has published many articles in the field of cardiology including one book (“Emergency Cardiology”), six book chapters and many peer-reviewed articles. He has also reviewed articles for several foremost cardiology journals and has presented at conferences nationally and internationally in the field of cardiology. Dr. Ghuran takes an active role in medical education, training general practitioners, junior doctors, nurses, technicians, paramedics and medical students. 2.Cardiovascular risk assessment and modification of blood lipids for the primary and secondary prevention. 4. Palpitations - a diagnostic and treatment strategy.